AutoTrac™ assisted steering system paired with Active Implement Guidance (AIG) allows operators to be more productive as they focus on tasks other than steering while traveling down the field. When operators have to spend their entire workday manually steering a machine while watching for obstacles and checking to make sure the implement is operating as expected, they tend to get worn out. 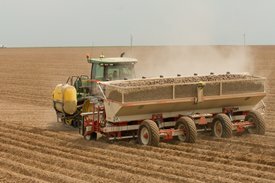 Using AutoTrac and AIG together greatly reduces the strain on the operator because the system accurately guides the implement down the most optimum pass, accurately placing inputs, such as seed or fertilizer, in the field. The implement can be monitored more closely to see if parts are wearing out or failing, allowing the operator to be proactive rather than reactive. A watchful eye can look for damaging obstacles in the field such as rocks, washouts, or holes caused by broken tile lines. An industry exclusive to John Deere, fingertip controls allow operators to turn the implement steering mechanism manually in tight spaces. All of these benefits result in more uptime for the equipment and an operator who is more alert throughout the day, a benefit everyone can appreciate. AIG helps optimize the use of inputs by increasing accuracy at the implement and facilitating seamless, repeatable passes throughout the growing season. 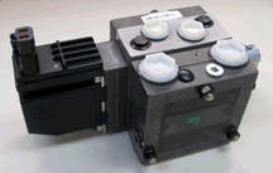 AIG can help to reduce input costs in a variety of applications. 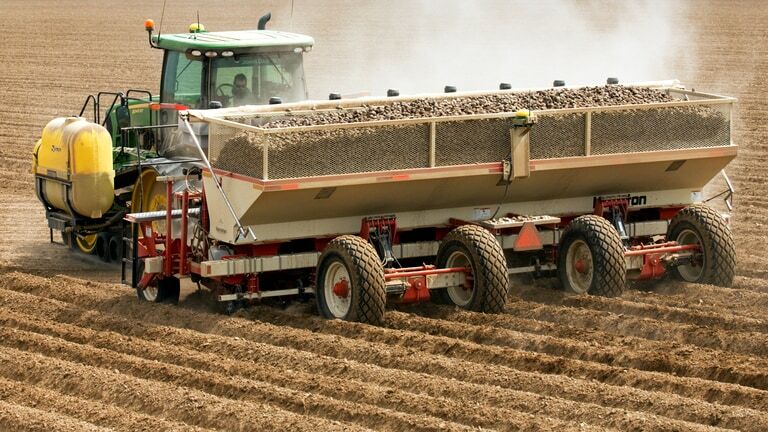 Potato producers and other specialty crop producers that make frequent passes through the field have seen the value of AIG as they precisely plant and care for their crops. Additionally, producers employing strip-till practices are better able to align their seed placement with their fertilizer placement, maximizing the uptake of their valuable nutrients. Maintaining the best crop quality is important in all farming operations, and is made especially difficult in cropping practices that require multiple passes through the field. Each pass during the production cycle puts the crop at risk. With AIG, producers no longer have to worry about the emerged crop, as both the tractor and implement are operating on the A-B line. A risk is also minimized when seed is planted with AIG. The improved precision of seed placement provides a straighter path for subsequent passes throughout the season. Compaction and crop disturbance are also reduced as AIG achieves its precision by keeping the implement and tractor on the same guidance path. At the end of the season, the results are better crop quality and improved yield, a value all producers can appreciate. Shared Signal can also be used with AIGto improve performance and reduce the overall cost of the system. The tractor and implement can use a combination of StarFire receivers. Use the following chart to determine the correct receiver configuration. *For optimal AIG performance, the StarFire 3000 Receiver should be mounted on the implement. Active Implement Guidance (AIG) requires an implement steering mechanism. This is common with any active implement supplier on the market. The method of controlling the mechanism can only be found from John Deere. 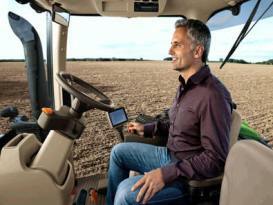 John Deere controls the implement steering device through the tractor's SCV. This industry-exclusive technology allows operators to engage and disengage AIG quickly and easily. Operators appreciate this when turning in fields with limited headland space. Simply disengage AIG and manually straighten out the implement after a turn by feathering the SCV lever. Many minutes are saved, even with the most experienced operators, by eliminating the process of backing up after turns to align implements. The time an operator spent getting frustrated turning large implements can now be spent enjoying planting. The fingertip controls also provide ease when parking implements in tight places or pulling through narrow spaces. 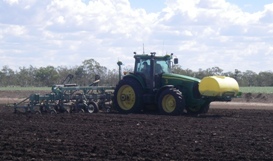 Other tractors are compatible with John Deere AIG with the use of an external SCV. AIG is available for all other John Deere and non-John Deere tractors with the addition of an external SCV valve and SCV switch. Both can be ordered from a John Deere dealer. The tractor can have an open or a closed-center hydraulic system. 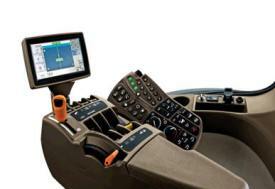 First introduced with the StarFire™ 3000 Receiver, the StarFire 6000 continues to provide shared signal functionality when pairing two receivers with Active Implement Guidance (AIG) or Machine Sync combine harvest automation via the GreenStar™ 3 2630 Display or Generation 4 CommandCenter™ display. Shared signal allows correction signals to be communicated between a pair of receivers, which can improve relative system accuracy and reduce the initial investment required to use AIG or Machine Sync combine harvest automation.